With warm mustard tones awash on the highstreet this season, it will be hard not to invest into this tangy Autumn Winter 2018 trend. From bright golden yellows, warm caramels and rich rusts, this versatile shade has made its way onto the catwalk with designers like Roksanda and Altuzarra tapping into this tasty trend. Not only that, but we’ve also seen this colour appear on some of our favourite celebrities with Gigi and Bella Hadid and Victoria Beckham all being fans of this vibrant hue. Here we show you how to get a taste for mustard and wear the trend to perfection. From well cut tailored separates to feminine silky pieces, we show you how to mix up rich bold tones for a strong style statement, which is also totally wearable for the season ahead. Create a beautiful silhouette with a nipped-in waist, this gorgeous silky belted Ghost dress falls just below the knee and will be the perfect dress to take you into autumn. Detailed with pretty cover buttons and flattering deep v neckline, it has a slight vintage feel accentuated with a printed silk scarf tied gracefully around the neck. Rust tones are a great way to tap into this trend if bright mustard is a little daunting. This stylish turtleneck dress by Miss Selfridge will be a great addition to your A/W18 wardrobe. 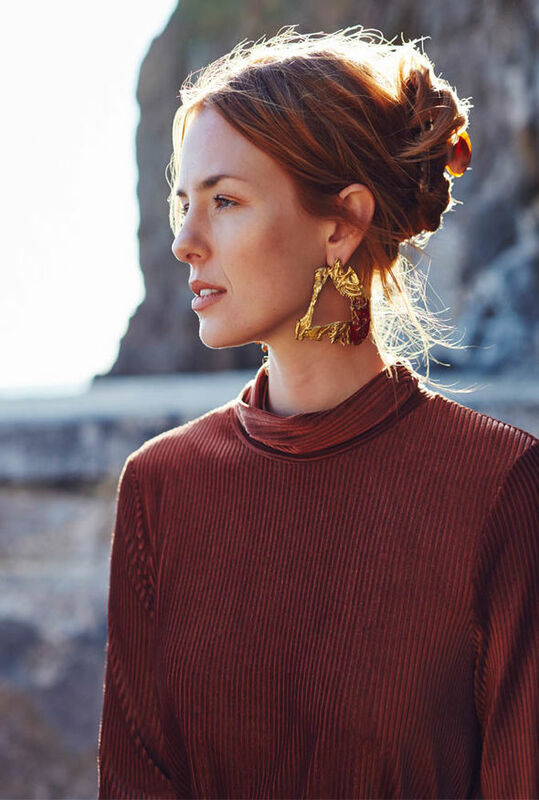 Sweep your hair up into a tortoise shell clip and go bold with your earrings for a modern stylish look. This high neck snakeskin print blouse is a really versatile piece, worn here with silky pants with a tonal stripe side detail; this would be a great look for weekend style. Cool accessories complete the look with a cute baker boy cord hat and simple tan leather cross body bag. The golden hour is shining on us and we’ve teamed matching mustard separates for a completely coordinated look. Mixing high street with designer for a luxuriously, effortless style. Break up the bright mustard hues with rusty red buttery leather knee high boots by young British designer, Dear Frances. Earthy tones mixed with vibrant mustard makes this look really pop and the feminine frill details on the YAS blouse creats a soft feel to the look. Coordinating your accessories will finish the outfit for a polished look. This printed pyjama style 2-piece from Red Herring at Debenhams is perfect for transitioning into autumn. Layer up with a rollneck for cooler days and add a statement faux-fur cropped jacket for ultimate luxe styling. Rusty orange instantly gives you the feel of autumn. This gorgeous dress from V by Very is the perfect throw on dress, the tie detail can be worn in many ways, but we love the feminine bow for added style points. Complete the look with slouchy tan suede boots and you will be ready for the season ahead. Jumpsuits are always a winner for easy styling, this wideleg spotty one by Ottod’Ame works perfectly layered with a cosy knitted jumper. Wear with chunky t-bar clogs for a playful look and when the weather gets cooler swap for snug knee high boots. With thanks to Hope Barton Barns for our accommodation in sunny Hope Cove. Properties available for weekly lets including last minute weekends. Visit www.hopebarton.co.uk for more information on the stunning site.